Being recognized as a Top 50 Public Research University is a lofty goal. 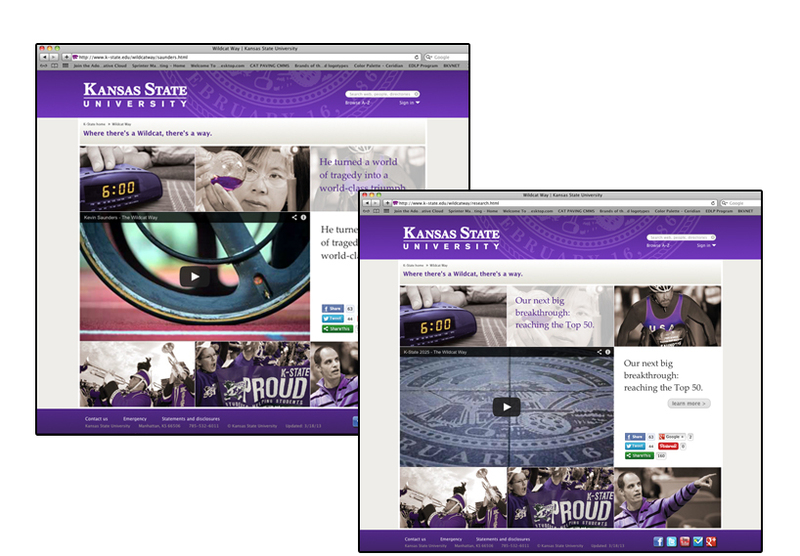 To help reach it, Kansas State University (K-State) needed a unified brand voice to support its national and international reputation. Team frank’s higher education marketing specialists went to work, crafting a powerful university-wide umbrella campaign that would engage and unite prospective students, current attendees, faculty, staff and alumni alike. 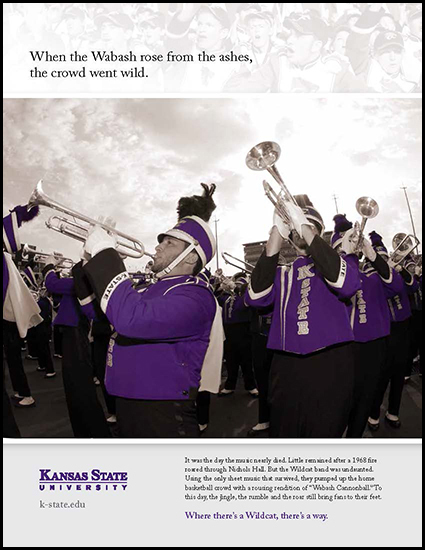 Using compelling and personal “Wildcat” stories, the campaign served as a rallying cry to the K-State community, and beyond. 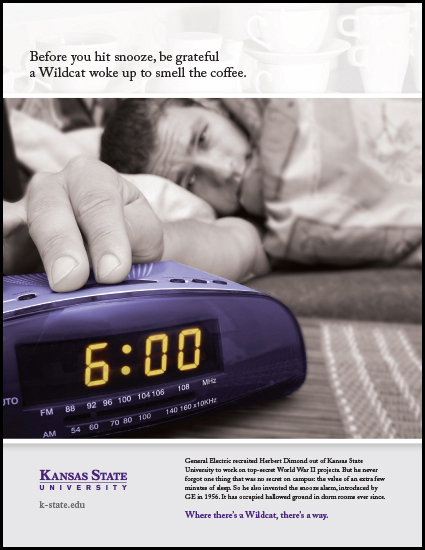 Immersive campus research revealed a palpable can-do spirit integral to the K-State Wildcat experience. As demonstrated by overcoming personal obstacles and an inspirational commitment to community, there’s something special about the Wildcat mentality. 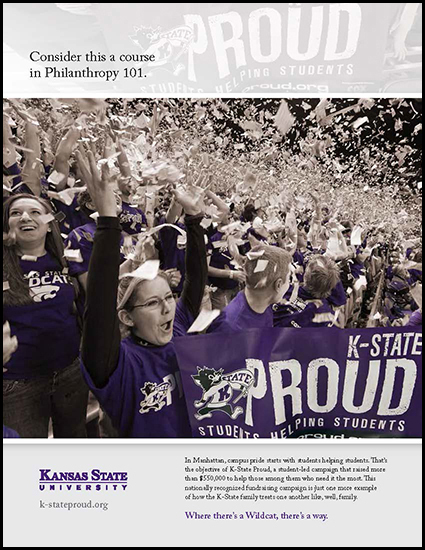 We created a holistic umbrella campaign centered on the rallying cry, “Where there’s a Wildcat, there’s a way.” This theme not only resonated with K-Staters across the board, it connected emotionally, recognizing the real sense of pride, unity and community that Wildcats share. 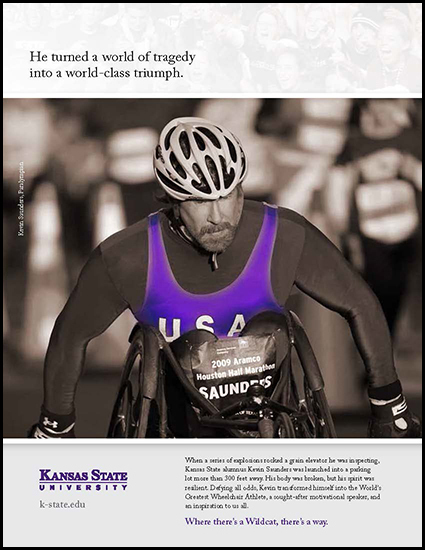 The “Where there’s a Wildcat, there’s a way” print campaign continued the overall storytelling approach with ads featuring actual Wildcats and their inspirational stories. 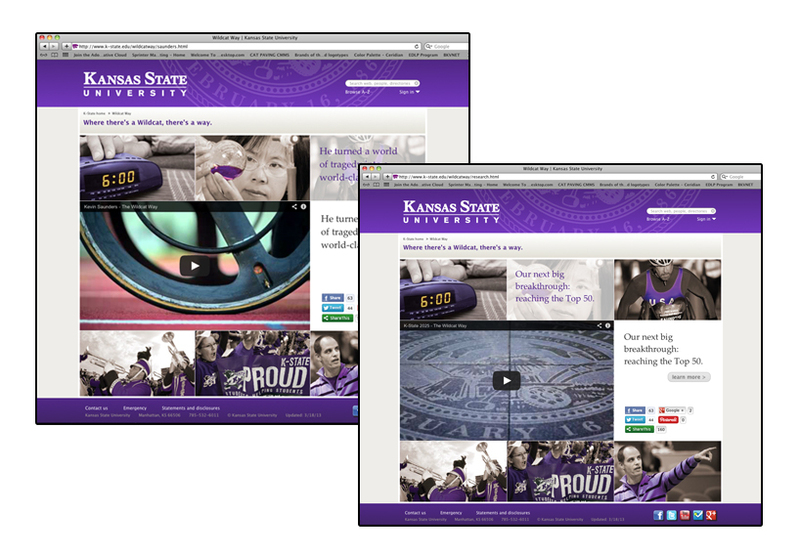 Working with K-State film students, we created a series of seven videos that showcased the Wildcat culture and student/alumni accomplishments while extending the K-State brand. 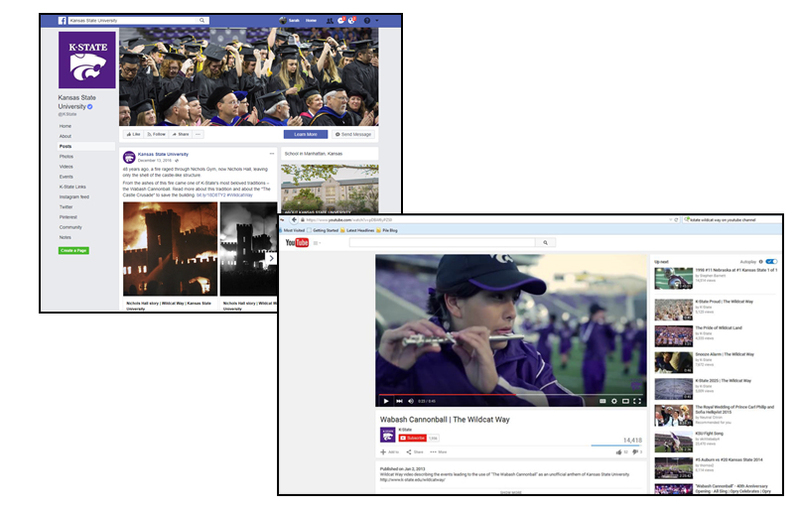 These videos were then hosted on YouTube and the University’s main website, and served as content for other channels, such as social media pages. 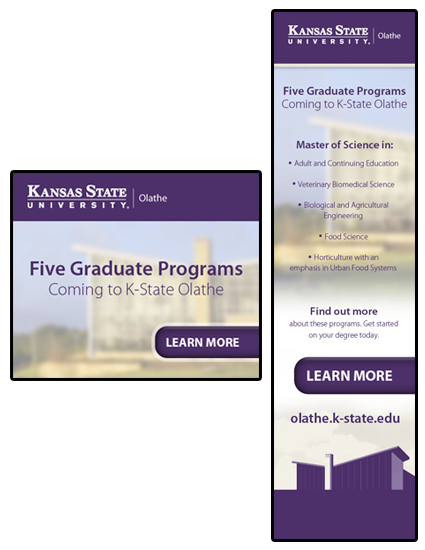 Paid Facebook ads, promoted tweets and a YouTube channel featuring the video series allowed us to reach students, alumni and the K-State community throughout their day, building further engagement and awareness for the University. 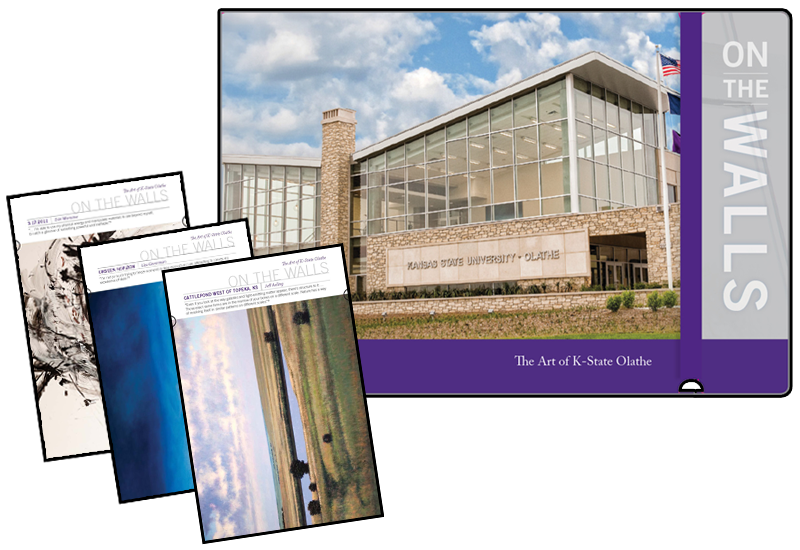 The opening of a new extension campus expanded K-State’s reach into a densely-populated area with many potential new students. But competing with 20+ other, local higher-ed options, it needed to find the right students to fill its new facilities. 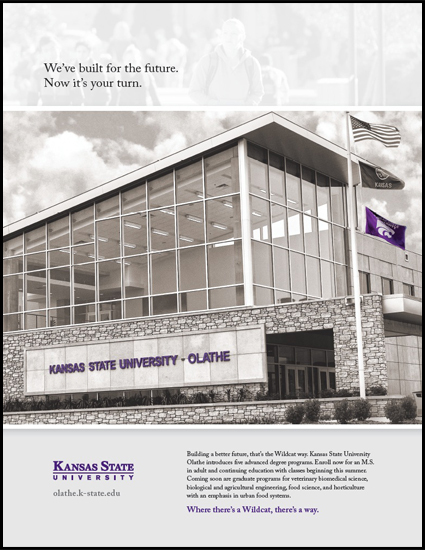 Building on our “Where there’s a Wildcat, there’s a way” brand campaign, we connected not only with the K-State faithful, but with a brand new student audience. The campaign far surpassed the opening semester’s goals, so much so that classes were filled to capacity on day one and online options were added to the curriculum to meet demand.